Infant Toddler Lesson Planning Tools developed by Patricia Hillman, CEO and Co-founder of the Infant Toddler Specialist Group (ITSG) @ Zero to Five Consulting, Master Level Trainer #1715 Texas Early Childhood Professional Development System (tecpds.org). 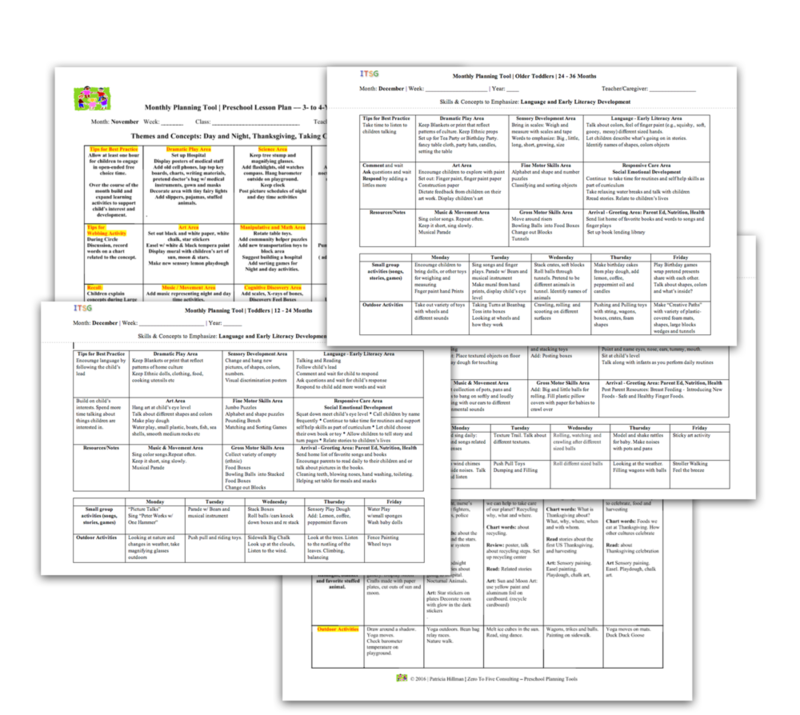 Infant Toddler Lesson Planning tools are a series of fully loaded, on line, lesson plans designed for a full year to support your program's curriculum and to offer a user-friendly framework for individuals with a child development background working in Infant/Toddler programs, Pre-school classrooms and Family Child Care Homes. Pre-school on line lesson plans are based on child development theories for children ages 3-5 years and support the philosophy that young children learn best through an environment that allows ample opportunities for exploration and discovery and plays a critical role in fostering independence, self-confidence, and a sense of curiosity about their world around them. ITSG Co-Founder/Owner Patricia Hillman has more than 25 years of experience as an Infant/Toddler Specialist and Early Childhood Educator supporting Administrators and Educators with training, mentoring, curriculum planning and implementation. Universal Lesson Infant/Toddler and Pre-school Planning Tools can be used by entry level and experienced Educators as a practical learning tool. Age appropriate developmental concepts, themes, learning activities and teaching strategies are listed throughout each lesson plan. On line lesson plan can be downloaded and edited to meet individual goals and needs of typically developing children including children with special needs and disabilities. Teachers can and add, or change activities on the lesson plan based on individual needs and interests of children, accomplishments, child outcomes and emerging curriculum. Purchase of a full set of Birth to Three or Pre-school lesson plan are accompanied with an Orientation and a Teacher’s User Guide.